These did not work at all for me. We did not enjoy the taste. If you give them a try, make sure you don't have any large pieces of anchovy in your dough. This received very positive reviews from everyone. It was different from other escarole soups I've made, as it's a bit more complex and the egg adds a nice creaminess. I was a bit confused by the recipe, which directs the cook to set aside the pancetta after rendering the fat but never says whether it should be added back in. Mine was a bit too chewy (and off-putting) so I discarded it after rendering. While I'm an experienced cook, I mostly cook pescetarian and am new to cooking with pancetta so realize I may have goofed. In any case, this soup is good! This book makes the case that, with the help of anchovies, almonds, or pancetta, we can cook vegetables in a way that keeps them the focus of our plates. Cal Peternel thinks we should eat the way that people have been eating forever: veggie-forward dishes seasoned with a little meat and fish (i.e., pancetta and anchovies). Celebrated chef and home cook Cal Peternell likes to eat today the way people have been eating forever: with vegetables at the center of the plate, seasoned with a little bit of meat or fish to make a meal savory and satisfying. 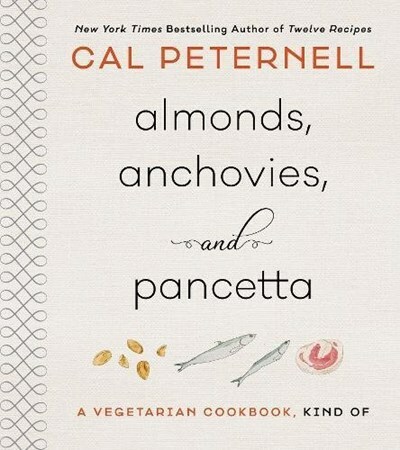 A little of the right kind of meat goes a long way, and in this book, the right ones are anchovies and pancetta, along with almonds, because nuts are the meat of the plant world. Cal uses them first for flavor, but also because it makes sense: taking savory little bites is unarguably better than big meaty mouthfuls. The salt in anchovies and pancetta draws out and enhances flavors, enriching the rest of the dish, and almonds compare favorably fat-wise and can bring a major flavor boost, especially when they’re ground up. This kind of cooking is healthy, leans toward sustainability, and is economical in a way that pleases both palate and pocketbook.